“Gold Leaf Buds Tall Lantern by Melanie Leppla” by Melanie Guernsey Leppla, Mad River Glass, LLC. 13″ h x 6″ w. Comes with a 25w/130v, T6 bulb. Cords has a rocker switch for easy on/off. Kyoto Lanterns are a series of sculptural lighting that capture the studied beauty and simplicity of the Japanese aesthetic while utilizing the perfect relationship of glass and light. The details and palate reflect a variety of elements such as fibers of woven mats or paper lanterns, the bindings of traditional packages or bamboo fencing, as well as elements of nature. Layered surface patterns of different hues and opacities allow a subtle transmission of light within to accentuate the qualities of the glass while creating a serene and meditative focal point. “I always strive to create original designs that are technically challenging, yet fun for me to produce. I enjoy making pieces of visual interest that are also a pleasure to use. I feel use honors the work I make,” the artist states. From first gather to the finished product, all the artist's glass is entirely hand crafted. Her original designs in hand blown glass are distinguished by great attention to detail, combined with a delightful, lighthearted sensibility. Guernsey Leppla earned her BFA from the Rochester Institute of Technology, NY. The artist has studied at the Pilchuck School in Washington State with master glass artists Dan Dailey and Fritz Dreisbach. 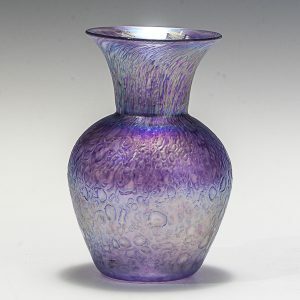 She has been an instructor at Horizons School of Crafts, MA; New Jersey State Council for the Arts Program, Wheaton Arts Glass Studio, NJ; and the Tokyo Glass Art Institute, Japan. The artist has worked in glass since 1983, and established her own studio in 1986. Guernsey Leppla has had her work featured in a Dekuyper Schnapps advertisement, and Better Homes & Gardens Magazine. The artist was honored with a Fellowship Grant by the New Jersey State Council on the Art/Dept. of State, and a fellowship Award from the Creative Glass Center of America. Guernsey Leppla's works are included in numerous public and private collections, including Rutgers Collection of Art, Rutgers University, Camden, NJ; the American Craft Museum, New York, NY; and the Museum of American Glass, WheatonArts, Millville, NJ. Her work has been exhibited throughout the world, including The Gallery of Fine Craft, WheatonArts Millville, NJ; New Jersey City Museum; University of South Carolina, Asheville, NC; and the Southern Alleghenies Museum of Art, Loretto, PA.